Ashtarinezhad, A., Matin, B., H Shirazi, F. (2013). Parabens Effects on Estrogenic Receptors of C13 Cell Line. Iranian Journal of Pharmaceutical Sciences, 9(3), 29-36. Azadeh Ashtarinezhad; Bahar Matin; Farshad H Shirazi. "Parabens Effects on Estrogenic Receptors of C13 Cell Line". 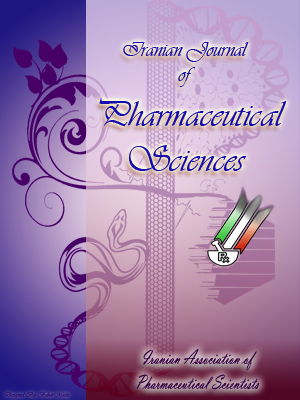 Iranian Journal of Pharmaceutical Sciences, 9, 3, 2013, 29-36. Ashtarinezhad, A., Matin, B., H Shirazi, F. (2013). 'Parabens Effects on Estrogenic Receptors of C13 Cell Line', Iranian Journal of Pharmaceutical Sciences, 9(3), pp. 29-36. Ashtarinezhad, A., Matin, B., H Shirazi, F. Parabens Effects on Estrogenic Receptors of C13 Cell Line. Iranian Journal of Pharmaceutical Sciences, 2013; 9(3): 29-36. Ovarian cancer is one of the major causes of death in women. Parabens are a class of chemicals widely used as preservatives in cosmetic and pharmaceutical products, they mimic estrogens, which are known to play a role in the development of different cancers in women. The Aim of this study was to investigate the proliferative effects of Methyl Paraben (MP) and Propyl Paraben (PP) on human ovarian adenocarcinoma C13 cell line.C13 cell line grown in phenol red-free RPMI 1640, supplemented with 10% NCS, were exposed to either 0-100 µM of estradiol (E)or tamoxifen (T). After 5 days, the number of live cells in each well (12 well plate) was counted using trypan blue assay to obtain the EC50 or LC50 of E and T using the regression fitness analysis on GraphPad Prism© software. The acquired EC50 for E was used for MP and PP exposure, alone or in a co-treatment with LC50 of T to investigate their effects on C13 growth curve.LC50 and EC50 of T and E were 3.125 µg/ml and 12.5 µg/ml, respectively. In a co-administration of these two, T showed to be a good cell growth inhibitor for the first 9 days, when the proliferative effect of estrogenic compounds lead to cell mitosis. Parabens showed estradiol pattern boost in cell growth for the first 8 days, but had more sustained and powerful proliferative effect compared to estradiol with a 300% increase in cell number on day 10. In co-administration with T, MP and E reversed T inhibitory effects from the beginning with MP boosting cell proliferation up to 500% on day 10.Both MP and PP showed delayed proliferative effects much stronger than E on C13 cells. MP was the most potent growth stimulating paraben on C13 cells with a rank order of MP>PP>E. It is concluded that parabens are much toxic in human than thought before, but with a delayed toxicity pattern. More investigation on chronic uses of paraben containing products is required for the safety measurement of these compounds.